Application Deadline: midnight on 28 February 2019. 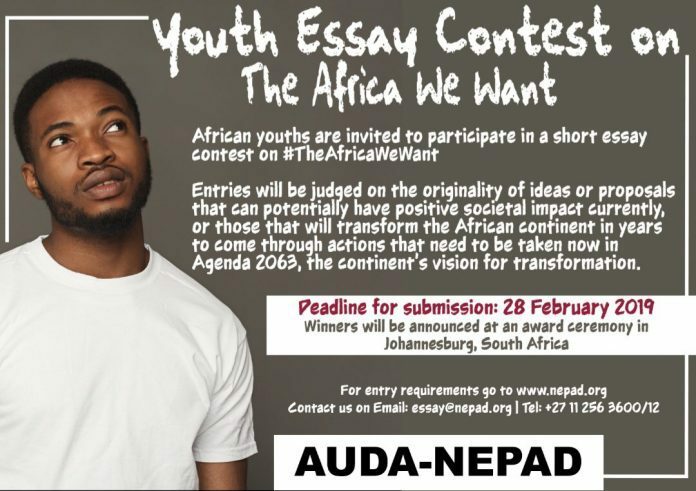 In an effort to promote African youth’s active participation in the continent’s development, the African Union Development Agency/NEPAD is running a short essay contest, targeting young African people and its diaspora in proposing concrete pathways through which Agenda 20632, the continent’s framework for transformation, can be fast-tracked. The contest aims to provide the space through which youths can express their views freely on “The Africa We Want” by articulating their aspirations and ideals for shaping the future of our continent. Winners will be announced in April 2019 at the ‘Championing of Agenda 2063 for #TheAfricaWeWant’ advocacy event in Johannesburg, South Africa. We urge all entrants residing outside South Africa to therefore have their passports ready, as the top five winners will be invited to the prize-giving ceremony in Johannesburg!! The winners will all be notified prior to the event by email or phone number provided in the submission. not eligible to participate in the contest. All youths (between the ages of 15 and 35) and especially girls, women and people living with disabilities are strongly encouraged to participate. insights and energies of the youth in shaping the pathways and participating in the implementation of Agenda 2063. Accordingly, AUDA/NEPAD is organising a short essay contest that will serve to solicit novel ideas from Africa’s youth. innovative ideas through a short essay format – the ideas or proposals should be those that can potentially have positive societal impact currently, or those that will transform the African continent in years to come through action/s that need to be taken now. 3) Potential for implementing the idea on a large scale using Africa’s own resources. place a check next to each item below to be certain you have not missed anything! Type the essay on A4 paper size, 2-3 pages maximum. Handwritten essays are accepted and should be on A4 paper size, 2-3 pages maximum. Please include your name on the essay. Swahili, English, French, Arabic and Portuguese. If posting your entry, please be sure to paperclip all of your documents together, including thevessay. RIGHT OF PUBLICATION: All essay submissions will become the property of AUDA/NEPAD. Announcement of winners’ names, photographs and essay content will appear in print and/or electronic media – at the sole discretion of AUDA/NEPAD. The judging panel is comprised of five independent individuals who will be nominated by the AUDA/NEPAD. The panel will review the essays and will select a total of five(5) finalists. The finalists will be invited to a high level platform in April 2019, called ‘Championing of Agenda 2063 for #TheAfricaWeWant’ in Johannesburg, South Africa. In addition, the best essays will be posted on AUDA/NEPAD’s website and other platforms. All five winners will be awarded with prizes at the awards ceremony attended by high profile leaders in Africa. This contest opens on 21 January 2019 and closes at midnight on 28 February 2019. Essays must be received by 11:59PM GMT on 28 February 2019 OR postmarked by 28 February 2019 if sent by post. Previous articleTWAS-DFG Cooperation Visits Programme 2019 for Postdoctoral researchers from sub-Saharan Africa. Carnegie Council International Student/Teacher Essay Contest 2016: Nationalism. Good afternoon,please I need the consent form so that I can submit my application. Please reply as soon as possible. Thanks in anticipation. I want to be part this year and i hope that opportunity will change something.